This advice is pretty straight forward – although it’s not as easy to pull off as one might think. When I have had the opportunity to dole this little kernel out to others, I generally try and explain why I think it is so important. This has everything to do with you making someone elses life easier. You manage to do that on a consistent basis, people come to rely on you and know that you can be counted on. Eventually, you move beyond being the first choice and become the only choice. The caveat to this advice is if you can’t follow through, you need to let someone know the instant you realize it. Besides taking accountability for your actions (or inactions as it were), this has to do with allowing others to deal with the effects or ramifications of you not doing your part. It has been my experience that people I work with realize that I have their best interests at heart, that in addition to the work I am responsible to creating, I am at the mercy of others following through on their promises as well. I explain that as soon as you realize that you can’t make good on delivering your promise, let the other party know so that they have time to deal with whatever problem you have just created for them. Take a moment and let that sink in, it’s important. The problem that you just created for them. If I can limit the damage of not making a schedule or a delivery, the other person has some time to react accordingly. Sure there is going to be some disappointment in the results but you can recover from that if this is not a pattern of behaviour – it’s their disappointment in you that is hard to recover from. If you are creating problems that other people have to deal with – what good are you as a service professional? Why would you expect someone to keep you around? Doing what you said you were going to do, when you said you were going to do it will take you very far in this world. . This is what I call a” career limiting” haircut. 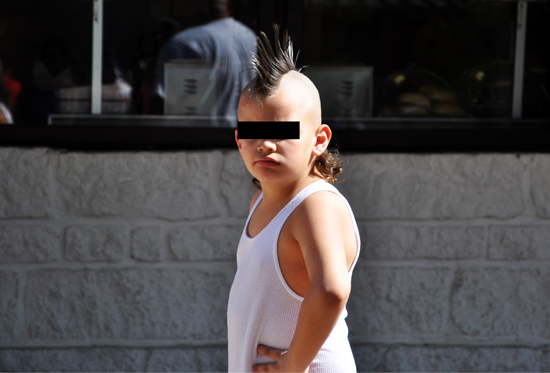 Unless you are in a punk rock band, no matter how hard your child begs you, do not let them have a mohawk hair-do with a little party going on in the back. I can’t even begin to focus on that t-shirt. That is a deadly combination junior is sporting – good looking out mom and dad. You haven’t lowered expectations for this kid at all.